I’m watching gold stocks right now jump 50-100% in the blink of an eye–even though gold itself is fairly steady at US$1300/oz. So I went to do my research. Where is the leverage now? Which is the best company? I run a lot of numbers in my research–you should know that about me. I found a stock that I think is set up be…please be sitting down…a 22-bagger. A 2,200 per cent win–just for this stock to get an average valuation….and a valuation that I will explain in full detail in a moment. It’s all based on very real numbers. It’s The Gold Stock of the Decade. I immediately went out and bought 150,000 shares. I had to–these stocks are now jumping 50-100% so fast, and by any metric I throw it at, this gold stock is the cheapest I have ever seen. When this stock moves it will move BIG and it will move FAST. And this is BIG–10 million ounces in the ground, in one of the most prolific gold belts in the world, and fully permitted. And it’s run by one of the best teams in the business–their last four gold deals are all in production now. I couldn’t ask for anything more. Oh, wait yes I could–I could ask that it has WAY less than 100 M shares out and be primed to be one of the lowest cost producers in the world. Guess what? This has it ALL. Equinox EQX-TSXv is up from 90 cents to $1.35–up 50%. So my question–what’s next? Where’s the next easy 50% PLUS gain? I spent 18 years raising money for gold stocks before I did oil and gas, and I know the answer to this–it’s in the developers. Only the leverage here is 10x what it is in the junior producers. That’s right–10 times. I’ll explain. Developers are the companies who have real gold deposits, but are not in production. Right now, around the world, there are several multi-million ounce gold deposits that could go into production–but need all the stars to line up for that to happen. They need a management team that can raise money. They need a good gold market. They need permits, grade, social buy-in from the nearby towns…it’s a long list. It takes years and years…and it seems like forever. No wonder investors just sell these stocks and leave them for dead. And when I say dead, I mean–stocks in the developers’ category can trade at less than 1% (one per cent) of their NAV if they were in production. Imagine the financial win that creates for one of these assets that makes it to production. And this team’s last four assets are all in production. ALL of them. Do you know what kind of profit scenario that brings investors who buy these stocks just before gold starts a bull market? I am talking wealth creation that lasts for generations. Even if you don’t catch the top or bottom, investors can make their year, or their decade, on one of these stocks. And you guessed it: I found The One. It’s The Gold Stock of the Decade. Tight share structure (100 M out=Strike 1, 200 M shares out=Strike 2, you get the picture). This gives me (and all shareholders) LEVERAGE. Low cost producer–bottom 25% for sure, preferably bottom 10%. Like I said–this gold stock ticks ALL these boxes! This gold stock has pretty much everything I look for–except one thing. I like to buy expensive stocks, where the management team can use their best-of-breed valuation to buy other companies. This company is NOT like that. This stock is DIRT cheap. When you look up the phrase “dirt-cheap” online, there is a picture of this 10-million-ounce gold deposit. That’s right–a full 10 million ounces. And get this–not only is it one of the world’s largest–it’s permitted to go into production! Let me tell you what DIRT cheap really means. On average an ounce of gold resource in the ground is worth $95 per ounce. The price paid per ounce of resource in the ground ranges from a high of $226 per ounce to a low of $11 per ounce. The average is $95 per ounce and the median is $97 per ounce. How does the micro-cap gold miner that I am writing to you about today stack up against those numbers? My Gold Stock of the Decade is trading at $4.22 per ounce. My Grade-7 math says this stock has the potential to be a 22-bagger–just to meet the average valuation of $95/oz. That’s LIFE-CHANGING WEALTH. Can you see the shore from your yacht yet? That chart shows my Gold Stock of the Decade is incredibly cheap–without question. But let me be conservative: the high point valuation is $226 per ounce–a 53-bagger–and the median/average falls just under $100 per ounce…..but let’s throw all of those out the window. Let’s just take the low point valuation of $11 per ounce. I hope you see that the stock price of My Gold Stock of the Decade is almost a TRIPLE–just to reach the most conservative transaction valuation. That tells me that when this stock gets discovered, it will move FAST and it will move BIG. And hey, I’m barely half done here. This company’s story gets better and BETTER and BETTER. At such a low valuation, you might think this is a debt-laden junior or one operating in an unstable, 3rd-world jurisdiction. But this is a debt-free company, in a developed country with a WORLD CLASS asset–10 million ounces! And this crazy-huge, low-cost gold deposit–is permitted for production! Permitting has become THE most difficult thing for talented management teams to achieve–anywhere in the world. 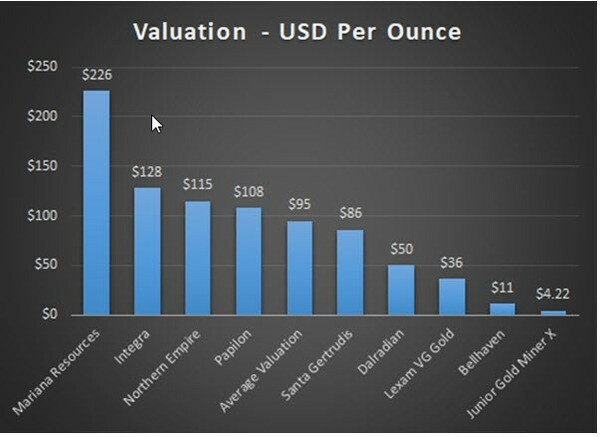 You will see in my next email that my Gold Stock of the Decade is independently calculated to produce gold at a lower cost than all but one company on this list–it will be the 2nd lowest cost producer among a well-heeled peer group. Convinced yet? Because by any measure my Gold Stock of the Decade is DIRT cheap. That’s not my opinion; it’s what the numbers show. But in the mining business cheap alone doesn’t cut it. You must have a management team that can not only fund these assets, but build them and sell them. Quality of management is everything. People truly are the most valuable commodity. The management team of this junior gold miner acquired this asset in 2016 from a much-less-well-prepared operator. The past two-plus-years have involved the management team quietly preparing the property for development —permitting, PEA work, laying all of the groundwork to get up and running. Now we are at the stage where this team is ready to make some noise. For this group this acquisition is the continuation of a career of buying, developing and selling projects for multi-bagger profits. This team has repeatedly made themselves and their shareholders a lot money. As per usual on this deal they own a ton of stock themselves and are fully aligned with shareholders. Company A $20 Million Identified mining inefficiencies and re-engineered, massively expanded resource base through acquisitions and exploration Sold to a junior producer for $400 million–20x BAGGER!!! Company B $5 million for a 20 percent interest Completed feasibility study and permitting, doubled the resource base through drilling Sold to intermediate producer for $464 million–90x BAGGER!!! In my next email–when I give you the name and symbol of my Gold Stock of the Decade–I will repeat with chart with all the real names included. But note that these buyouts totalled over $1.8 billion. This is how you win as an investor in the resource sector. You find serial entrepreneur teams like this and ride their coattails. These kinds of entrepreneurs buy low, add value and then exit……..rinse and repeat again. They don’t go to work for big paychecks, they go to work to create value and get rich beside shareholders. That’s why I just bought 150,000 shares of my Gold Stock of the Decade–not only can I ride on the coattails of this management team…I can do it by getting in today at a DIRT cheap valuation. That creates a powerful double whammy for the stock. A DIRT cheap entry price and a management team that is adding HUGE incremental value going forward. I get VERY excited. Like I said–this stock can change my life. I put $50,000 in. Grade 7 math says I could get $1,000,000 out. The action in the stocks of gold producers is screaming that the Market is about to experience a bull market in gold. After a quick 50-100% gain of many junior producers, developers are the next group of stocks to have Big Runs. After years of investor neglect, these stocks are trading DIRT cheap–even the high quality ones. But I’ve found The Gold Stock of the Decade–10 million ounces! Permitted! 1 – Name this $1.8 billion management team and explain why this asset is a perfect fit for them. Everything they touch goes into production. And this is the largest gold asset they’ve ever had–in a share structure with under 100 M shares out–that creates HUGE leverage. To be clear…you don’t need to be a gold bull or a fan of gold miners to appreciate this opportunity. You just need to understand very simple math and love a micro-cap bargain. Objective numbers show this stock has the potential to be a quick 22 bagger. That is LIFE CHANGING WEALTH. Watch your in-box, the name and symbol of this one is coming to you TOMORROW.